Many chronic grass sickness patients are anorexic and in a catabolic state. Inadequate voluntary intake of ntrients is therefore a major determinant of survival. During the first two weeks of the disease dramatic weight loss occurs and, unfortunately, many horses are euthanised due to profound weakness. Appetite may decline further, in association with the devleopment of rhinitis sicca, which likely has an influence on olfaction (sense of smell). 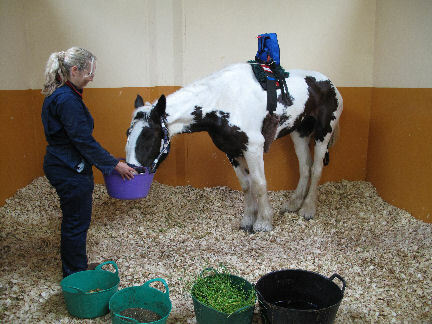 This enteral feeding study has provided a new method of increasing nutritional intake for chronic grass sickness cases when, in the first few weeks of illness, they are at their most vulnerable and struggle to swallow food.